#1. For the white t-shirt that Seung Gi wore for the first half of YAAS, you had to be an Airen who came from the farthest country. A Toronto fan won it. #2. 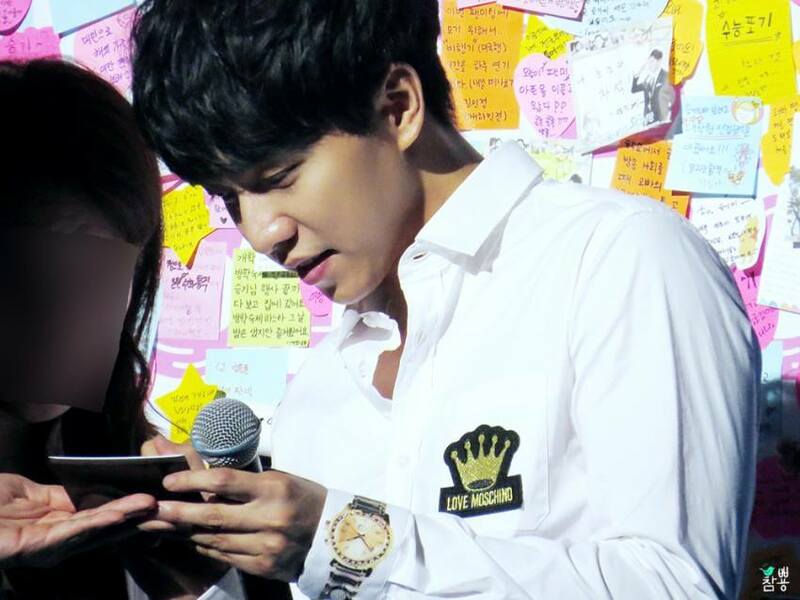 If you had the same birthday as Seung Gi, or your birthday was on August 24th, the day of the fan meet, or on Seung Gi’s debut day, you were also eligible for special prizes. #3. Next gifts went to the oldest and youngest fans in the audience. One person who was born in 1940 won and an 11 year old girl from China won for the youngest. Ok, this is where my fan account begins. 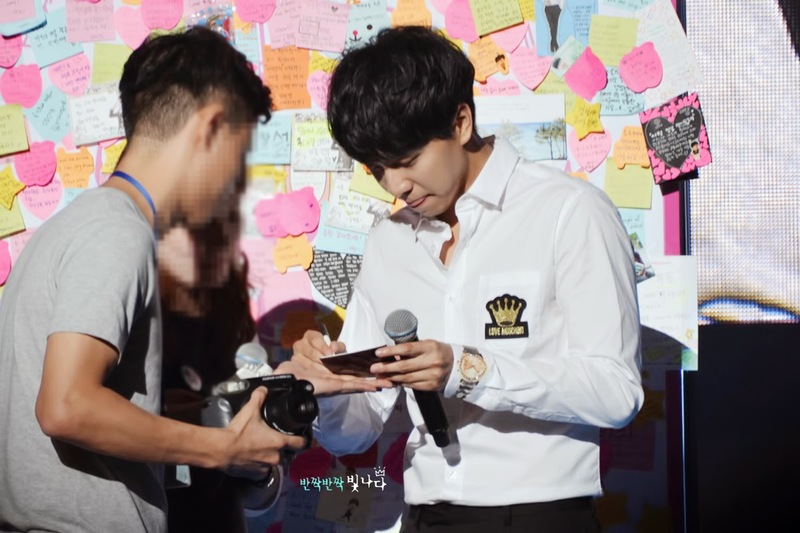 Next, the staff brought out the “Best Airen” Easel with all the post its and Seung Gi read some of them aloud and interacted with the fans. He admitted that he had actually read them backstage but I couldn’t have imagined that he would have picked mine out of all those post its. After reading through more post its, he finally reached mine and read it aloud. Then he paused and explained to the audience that it is really difficult for overseas fans to get news about him in English since everything is in Korean. He flipped the back for a name and there wasn’t one so he asked whose it was. Without me knowing, I stood up and shouted,”It’s mine!”. Then a staff member came to me with a mike to say something but I lost my chance since I was too stunned and they moved onto other post its. 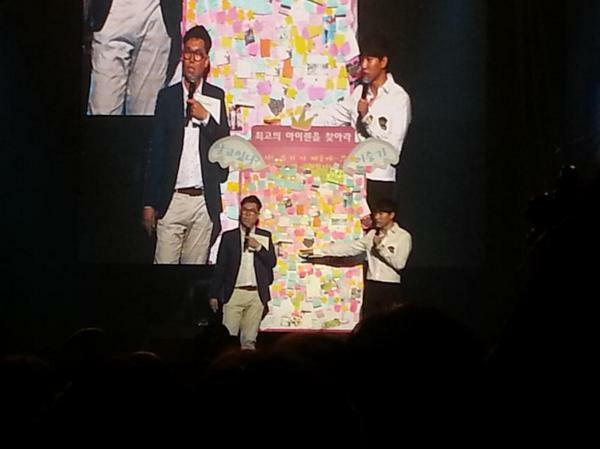 Seung Gi said that he would definitely choose my post it before reading through some more. His fan service was really excellent as usual and made everyone so happy. I thought the MC and Seung Gi were going through more posts to find better ones until he finally went back to my post it and took it from the easel. He asked me to come up on stage and that’s when I started freaking out but not really knowing that I was. I guess I was too dazed because all I remember is hearing a security guy telling me to hurry up to the stage. As I approached the steps to the stage, I saw Seung Gi looking at me and I was happy, nervous, excited, and just shocked to be picked. I greeted him in Korean and shook his hand. They were so soft as my Airen friends had told me. Then I was handed a mike and the MC asked me to introduce myself. I first introduced myself in Korean very briefly because my voice was shaking so much. Then I spoke in English and said, “Hello, my name is Elise Min and some of you may have read my blog. It’s an honor to be up here. I hope to meet many of you after the fan meet.” Gosh..Now I’m like “Why did I say that?” It just sounds lame to me now. Then Seung Gi seemed really curious about how I started my blog and I just told him that I try to blog on a regular basis because of my profession. Then he asked me about my blog and I told him about my readers, especially those in the Philippines..that they really wanted him to visit. I also mentioned Malaysia and Indonesia. 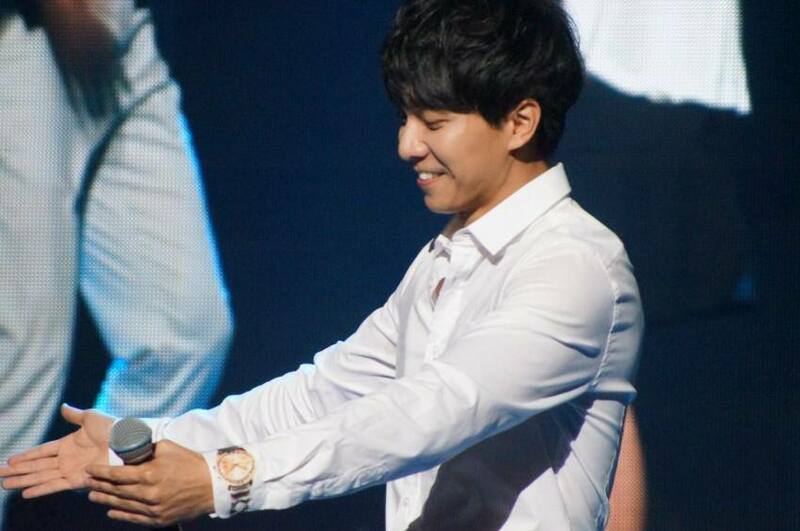 Seung Gi laughed since I was rattling off a list of countries, but it was comforting and cute. He was doing his best to put me at ease since I told him as I came up on stage that I was Korean-American [Born in Korea (I am 100% Korean by blood) but immigrated to the USA at the age of 3~ so please don’t expect my Korean pronunciation to be perfect and full of slang like a native Korean who grew up in Korea] I also told him that his English was really good at KCON and he told me that he had just memorized it. He asked me some questions about translating and I mentioned that I also subbed for Viki.com and was the one who subbed his interview with Eric Nam on the red carpet at KCON. He was sincerely surprised and smiled. 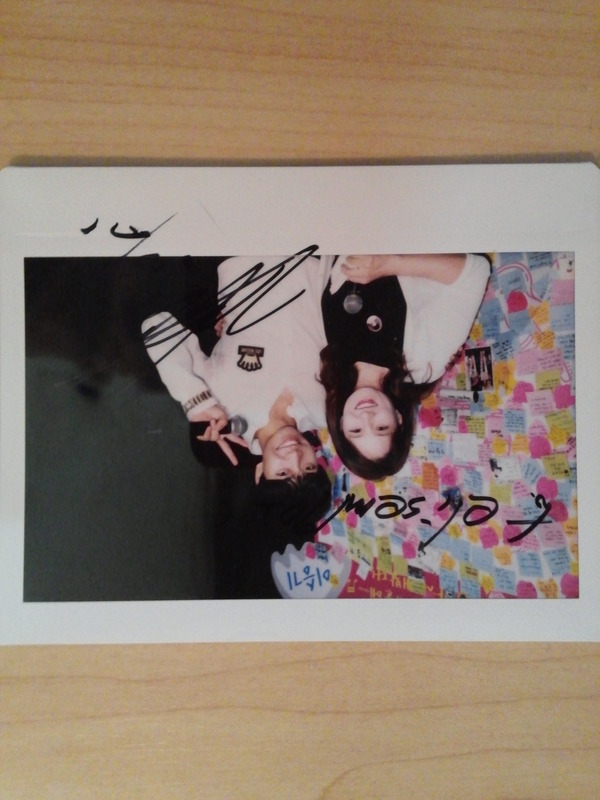 I was freaking out (like hyperventilating, LOL) and anyway, the MC asked me where in the USA I was from so I told him. He said to me “Oh, so you’re near New York.” I was just too nervous to say much so I said yes. He then asked me if I had a wish to ask of Seung Gi. I just stared at Seung Gi while he was sooo sweet to me. He crouched down to my eye level and asked me what he could do for me. OMG! I was ready to freak out. My mind went blank and all I remember saying was that I wasn’t a sasaeng fan or anything and I hadn’t really thought about it. Then I said I would love to have an autograph if possible. I mentioned that “someone more well known” than me “had your autograph recently at KCON” and Seung Gi just gave me this blank look as if he was asking,”Who?” Ouch! That’s another story, but quite an unpleasant one since that’s how I started this blog. I couldn’t tell Seung Gi and the audience about that or all the horrible things that person and the organization that supported her did to try to stop me from spreading his love and news. Luckily, the official fanclub remained neutral and many members gave me a lot of support after the fan meet. 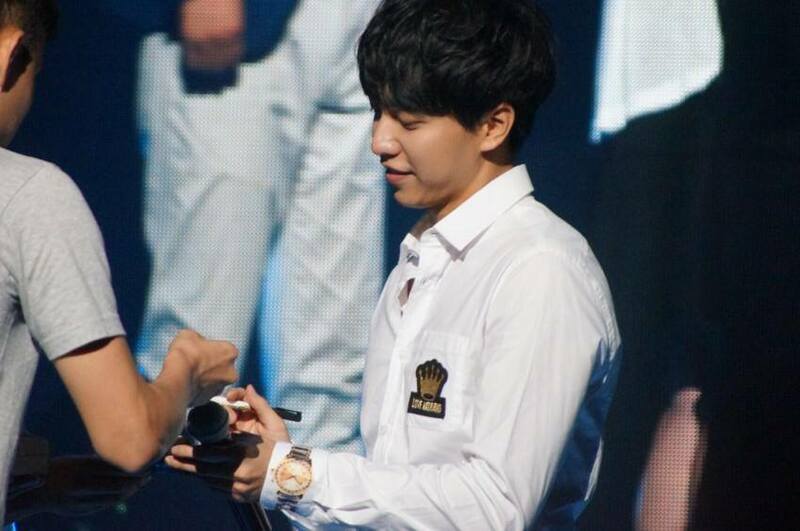 Seung Gi had healed so much of the wounds from the atrocious things they did to try to stop me from blogging. He recognized my blog as one for International Airens at the fan meet and I am so honored. 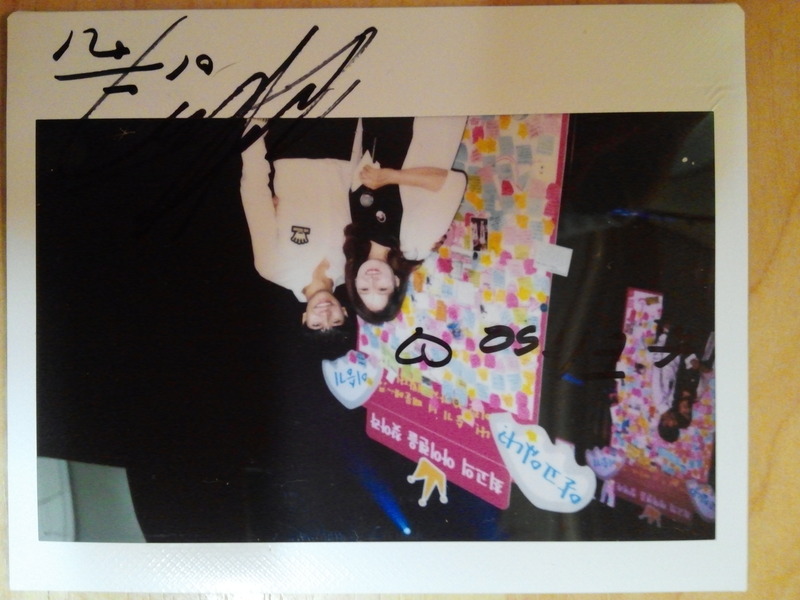 ♥ I gave him my blog address and I thanked him again as I shook his hand once more at the end of the fm, this time, more like a slight touch since there were so many fans. He said thanks and I still remember the softness of his fingers. Kyaaah! Categories: Event, fan account, fan meeting, fan signing, Hook Entertainment, Photos, Uncategorized | Tags: Airen 6 FM, autograph, fan account, Lee Seung Gi, photos | Permalink. ❤ i was just smiling whiled awed! thank you for sharing. siempre que leo tu historia lloro de emoción, me parece que ese día estaba contigo allí, siento una emoción muy grande, aunque tarde recibe mis felicitaciones..
great Elise 😉 Nice to hear this! Thank you so much Elise for this wonderful fan account. Really happy for you and also thank you for mentioning Malaysia. 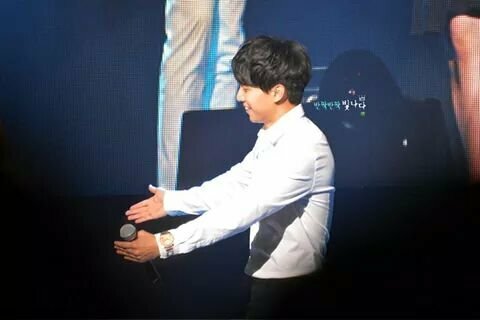 Really missed Lee Seung Gi and hope he can have another fan meet in Malaysia. Thanks Elise Unnie udah mentioned Indonesia dan sharing tentang Seung Gi yah.. I really am so happy for you Elise. I hope you keep on fighting. I may not always comment or read your posts but rest assured that I shall always be praying for you. God permitted this, I was/afraid I can not access this but I went thru… I guess He wants me to tell you how happy I am for you. Elise… keep fighting..
your blog is one of my favorites. thanks for your sharing and congratulations on being chosen as the “Best Airen” and getting a big hug. you are beautiful in the picture. would you mind to translate the “10 Questions 2014 For My Airen”? thank you! Thank you for your kind words. I’d be happy to translate “10 Questions 2014 For My Airen” as soon as I can. I already have the video saved on my twitter account. It’s just a matter of when I have free time to blog. I hope to post more often this week. 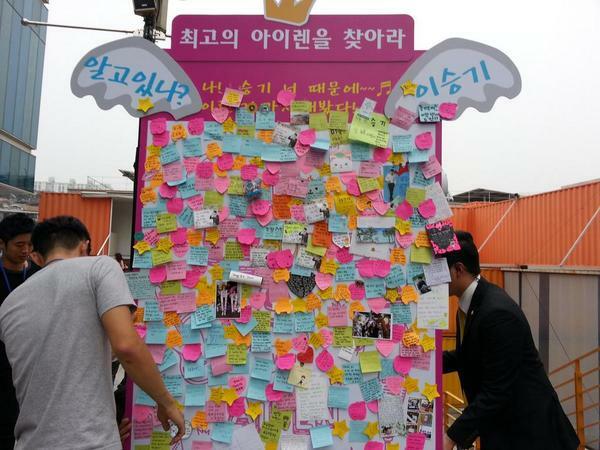 Oohh.. Elise unnie you are such an angel to all airens… My tears keep on falling while reading your story…. Thank you for mentioning philippines to seungi yah… Im always praying and hoping that he will visit our country… Godbless your blog and keep on spreading our Seung Gi LOVE…. More power Unnie!!!! I’m so proud of you Elise!!!! Thanks Elise for sharing your exciting story, and again.. Chukkae!! ^^ so happy for you..